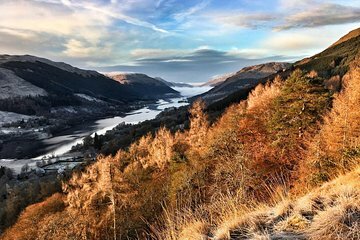 Entfliehen Sie der Hektik von Edinburgh für eine ganztägige private Tour durch die zentralen Highlands. Sehen Sie Schlösser, Wasserfälle und historische Dörfer, während Ihr ortskundiger Reiseleiter sich um das Fahren kümmert. Passen Sie die Reiseroute an Ihre persönlichen Interessen an, einschließlich eines möglichen Stopps in einer Whiskybrennerei. Lassen Sie sich individuell beraten, wo Sie traditionelle Gerichte essen können. Abholung vom Hotel und Rückgabe sind inklusive. Chris provided us with a “once in a lifetime” day-trip. We planned this Highlands Tour as a holiday gift to ourselves. Chris gave us a detailed, thorough and exciting history of Scotland. What a truly wonderful day. I prefer off the beaten path experiences and sites. From the outset, Will was communicative, responsive, and really heard what I had to say. On a couple of our stops, I am confident in saying I was the only tourist there. Great conversation, terrific sites, It went exactly as I was hoping. Very highly recommended. Our favorite tour of our 3 week holiday. We chose the eastern highlands because we wanted to see St Andrews. Chris was a perfect guide mixing humor, history and hidden gems of each area. St. Andrews was beautiful, as well as the surrounding area. We had a mix of driving and walking. We had the best and freshest fish and chips in Scotland. A great day. Thanks again Chris. Our tour guide, Moira, took our requests and put together a customized tour. She planned the day perfectly, found a terrific pub for lunch, was interesting and knowledgeable. A real highlight in our vacation. Worth every penny! We absolutely loved our tour with Will!!!!! He took us to a great local eatery for lunch and was beyond flexible. It really felt like we were just hanging out with a local. He was beyond personable and quite knowledgeable!!! This tour was OUTSTANDING and worth every penny! Will was so entertaining, knowledgeable, and just a pleasure to get to know during our day together. He peppered the day with little known sites, fun facts and surprised us with a few Game of Thrones and Outlander locations! When in Scotland again...and we will be...I will certainly be contacting Will!